Moreland residents are presently being treated to a new round of ‘consultations’ throughout the municipality, and being indoctrinated by Council staff on the assumed benefits of residential rezoning (radically increased residential densities) and of neighbourhood activity centres as a central feature of the ’20-minute city’. Under this new feudalism, it is expected that residents will access all of their basic material needs and services within a 20 minute walk, bicycle trip, or by public transport. Superficially this may seem a nice idea. On closer scrutiny it is fanciful, so expensive that the necessary additional infrastructure will never be provided, and little more than a pretext for an atrophied Australian business culture dependent upon population growth and capital widening; incapable of building a genuinely modern economy. Selling dirt to China and building a national ponzi economy based on population growth and making each other cappuccinos. Dumb and dumber dressed up as community building and environmental responsibility, but, very politically fashionable – so much so that the left enthusiastically does the economic right’s public relations for it. The Greens on the Moreland Council are a case in point. That the Moreland Council is conducting a new round of ‘consultations’ on the new feudalism is curious. This is because of the abject failure of the previous round of ‘consultations’ on residential rezoning under the Napthine Coalition government and the subsequent betrayal of Moreland residents on the issue by the Andrews Labor government. The overwhelming message from residents to the pro-density fundamentalism of Council and the Victorian government the first time round was an emphatic rejection of higher residential densities. At the time, the resounding rejection of higher densities by residents served to expose the faux democratic sentiment of the Council planning elite, when Council was subsequently advised, in an official report on the rezoning consultations, that Council should not feel bound to follow mainstream opinion on the rezoning issue anyway. The latest round of faux consultation is all the more curious because Council’s 2014 rezoning proposal (put to the Coalition government in mid-2014), which at best represented a compromise between the densities that the Moreland city planners were promoting and resident objections to higher densities, was subsequently rejected by the new Labor planning minister, Richard Wynne. As detailed below, the newly elected Victorian Labor government essentially gutted the Moreland compromise rezoning proposal of the key measures that would have preserved some semblance of low-density neighbourhood character in the Neighbourhood Residential Zone. As thing stand, the current ‘consultations’ are being conducted in a climate of angry disbelief on the part of residents who carry feelings of insult from being treated contemptuously the first time round. Yet, Council and the Victorian Labor government simply proceed as if residents have the word ‘idiot’ tattooed on their foreheads. From late 2013 to mid 2014, a drawn out and at times heated struggle took place between various resident groups within the municipality of Moreland and the Moreland City Council over the implementation of new residential zones, which foreshadowed a radical increase in residential densities within the City. Prior to the demise of the Bracks/Brumby Victorian Labor government in late 2010, Labor had indicated that it would pursue a policy of limiting residential growth in some suburban locations within Melbourne, facilitating rapid residential growth in other areas, and allowing intermediate growth in others. On coming to government, the Coalition ran with this three zone residential policy approach, which became a source of heated, ongoing contestation in several local government areas. Moreland was amongst them. Under the Coalition Government, local governments were charged with formulating proposals for the implementation of three residential zones largely differentiated by the levels of density that each zone would facilitate. Moreland city Council therefore also undertook this task. Generally, the Council and Council planning staff showed themselves to be enthusiastic advocates of increased residential densities, despite resident resistance, on the misguided premise that this would represent municipal progress. After a series of exhausting public consultation meetings, conducted by the City of Moreland, where the overwhelming sentiment of residents was that increases in residential densities should be kept to a minimum, particularly in the ‘low density’ Neighbourhood Residential Zone, the Moreland Council lodged a rezoning proposal with the Rezoning Advisory Panel of the then Minister for Planning, Matthew Guy. The proposal that was lodged was a significant compromise, which many residents considered unsatisfactory in so far as it allowed for residential density increases in excess of that considered compatible with the preservation of valued neighbourhood character. Nevertheless, key aspects of the Moreland Council proposal, which rendered this compromise acceptable in some degree to some residents, were the inclusion of minimum lot sizes for new dwellings and minimum private open space requirements in the Neighbourhood Residential Zones (the proposal formulated two variants of this zone – one for the North and one for the South of the municipality). These provisions would have facilitated a significant increase in housing stock within the ‘low-density’ Neighbourhood Residential Zones, while still preserving a semblance of neighbourhood character. In most cases, these provisions would allow single detached dwellings on a single lot to be replaced with two, and in some cases three dwellings. As the Moreland Council proposal had not been accepted by the Napthine Government before it lost office in late 2014, the proposal subsequently came before the newly elected Andrews Labor government and Planning Minister, Richard Wynne. Wynne accepted the Moreland Council proposal, but only after the minimum lot size and minimum open space requirements had been removed from the proposal. Therefore, what was already a tenuous compromise between the aspirations of the majority of residents and the pro-density predisposition of the Moreland Council proposal was substantially undermined. Wynne’s removal of these provisions has effectively gutted the hard won compromise reached between Moreland residents and the Council by mid 2014. A number of issues are raised about the Minister’s bastardisation of the Moreland residential rezoning proposal. 1. The removal of minimum lot size and minimum private open space provisions of the 2014 compromise rezoning proposal has essentially removed any meaningful protective measures against the type of residential density increases that the majority of residents see as an attack on their areas' liveability. Unwanted development will continue unabated, perhaps now even accelerated. It is simply insulting that Council now describes the Labor Minister’s prescription of 4 dwellings per lot (regardless of lot size) as a formula for ‘minimal’ change. Under these conditions, even in the lowest-density zone, the change will be drastic and destructive of the neighbourhood character that most residents seek to preserve. Such language is bureaucratic manipulation at its worst – again, taking the public for fools. 2. In Opposition, Labor Party figures at times aligned themselves with resident protests against proposed Coalition density increases. That a Labor Government should subsequently impose a rezoning outcome worse than many residents would have expected from the Coalition will almost certainly breed cynicism towards Labor in Moreland at a time when Labor should be presenting itself a Party of meaningful alternatives. This is a missed opportunity. One Victorian Labor parliamentarian was silly enough to add insult to injury to assert to a meeting of informed residents that Labor had saved them from the residential density excesses they would have suffered under a Coalition government. 3. Victorian Labor now represents a greater threat to suburban amenity in terms of density and over development than the Coalition had been. Residents may now begin mobilising against Labor in the same way they did against the previous Coalition Government. Labor party members and supporters will be amongst those mobilising against the Labor government on this issue. 4. Victorian Labor appears to have learned nothing from residents' fierce opposition to the proposed residential density increases under the Coalition government. Labor has just picked up from where the previous unpopular Labor minister, Justin Madden, had left off, as if there were no history in between. The take away message from Richard Wynne's treatment of the residential density issue in Moreland is that the Labor government offers no alternative to the Coalition and has no regard for the struggle of Moreland residents against the contempt of the Coalition government on this issue. 5. The negative impacts of rapid population growth on urban amenity, and growing metropolitan dysfunction, played a significant part in the downfall of the Brumby Labor Government in 2010. Given this, it is extraordinary that the current Labor Government had demonstrated a willingness to ignore the aspirations of residents in a way that will almost certainly reduce its chances of winning the seat of Brunswick at the next Victorian election. Some of the most fierce opposition to increased residential densities was from West Brunswick. 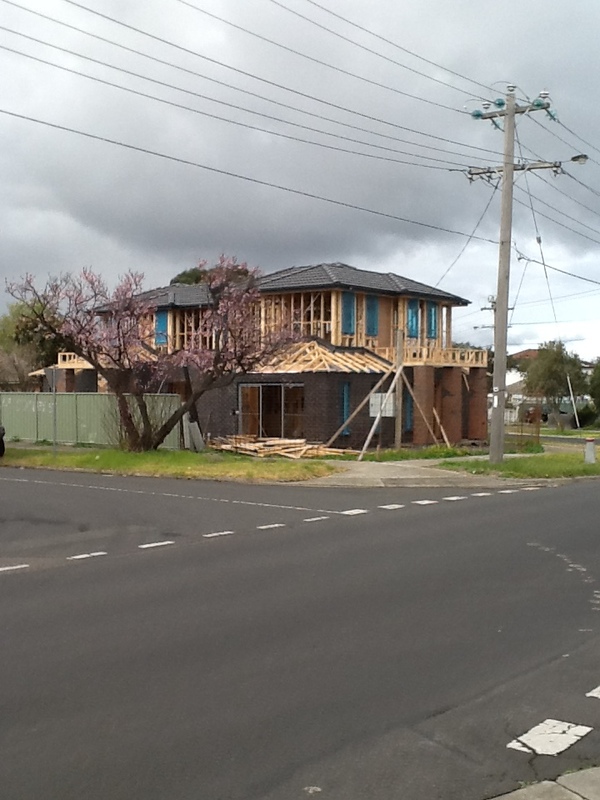 What is Minister Wynne’s attack on suburban amenity in Moreland likely to yield in terms of the built environment? 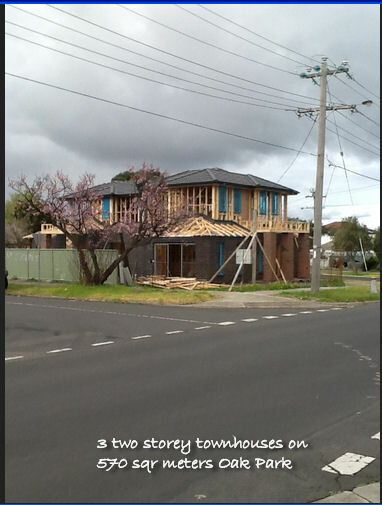 Established separate detached dwellings in Moreland are now dropping like flies as small scale, medium-density developers run riot, reaping the windfall benefits of reckless policy. The photo below provides an example of what is likely to become the norm. This site is just under 570 square meters, which until recently had a modest single detached dwelling on it, with a small yard and garden. Whereas under the Moreland City Council’s original rezoning proposal, this site would likely have been allowed only a single double-storey dwelling, in keeping with Richard Wynne’s bastardisation of the Moreland rezoning proposal, permission has been granted for three double-story townhouses. Despite the Minister’s fatuous claim that Labor’s rezoning provisions in Moreland will protect valued neighbourhood character against over development, Labor has now ensured the continued destruction of the neighbourhood amenity that the majority of residents wish to protect. Political sophistry at its worst. It is little wonder that many Australians rank politicians with used car salesmen. Even given the irresponsible levels of population and household growth expected under current immigration settings, in all likelihood, the estimated increase in dwellings required for Moreland would have been achievable under Moreland’s original proposal to the Coalition government in 2014. Wynne’s decision seems to be pure ideology: increased residential density is ‘good’; low-density is ‘bad’. It is not surprising that Wynne was a senior advisor to former Labor Deputy Prime Minister, Brian Howe, in the early 1990s. Howe was a zealous advocate of ‘urban villages’, the antithesis of low-density, garden suburbia. To ‘urban village’ ideologues, including those on the Moreland Council, resident wishes are an obstacle to be overcome, not something to be respected. Labor, it seems, is quickly digging itself into a political hole again on urban policy.